JBA provides clients with a proven model for healthcare transformation. 1. Gain top management commitment. 4. Develop global production system leaders. 5. Educate the organization in key concepts. 7. 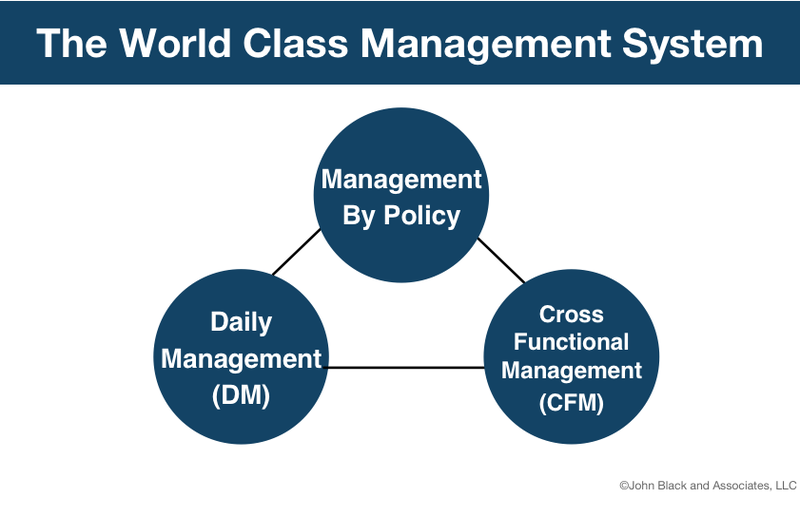 Implement a world-class management system. 8. Establish visibility and accountability. Without commitment from top management, transformation efforts are doomed. All too often, Lean is seen as a set of tools and methods instead of a new way to lead and manage work. Leaders must commit to becoming Lean leaders who teach, coach, and support both the Lean transformation as a change management system and who also serve as sponsors for improvement teams. JBA sets the expectation that all senior leaders and their direct reports be certified as Lean leaders. JBA supports the creation of a senior leadership team to direct the transformation efforts. This team sets priorities for service lines, use of resources, and targets for improvement work. JBA assists each client in forming a Kaizen Promotion Office (KPO). The leader of this office reports to the CEO. Kaizen Operations Teams (KOTs) are formed within each service line to support improvement work. These kaizen specialists become the foundation of the infrastructure required to implement and sustain the Lean management system. The Steering Team establishes priorities for the transformation, including the selection of the key service lines. This team also sets targets for key performance measures that guide the transformation. JBA conducts Kaizen Planning, led by the Steering Team with participation from service line leaders, to align the internal resources to specific improvement targets and Kaizen events. JBA believes the best way to implement Lean in your organization is to give you the knowledge and skills to do it yourself. After completing the JBA module marathon requirements, leaders will continue their certification process by participating in Rapid Process Improvement Workshops (RPIWs) with coaching from JBA. Leaders are expected to participate in 3 RPIWs — as a participant, a sub-team lead, and a team leader. The JBA Lean leader certification process is not only rigorous but requires the commitment of leaders to spend the time necessary to gain the knowledge and skills to learn how to lead differently. To maintain a JBA certification, Lean leaders must meet annual maintenance requirements. The Kaizen Fellows program is an integral part of the Lean management system. The program develops leaders who are skilled in understanding and applying advanced Lean thinking, tools, and methods. It is an intense, multi-year program that involves on-site “learning by doing” in world-class organizations. The Kaizen Fellows program originated with the Boeing Global Production System Specialist Program started by John Black. It evolved into the Kaizen Fellows program that Black helped launch and coach at Virginia Mason Medical Center (VMMC) under the leadership of Dr. Gary Kaplan, CEO, and Mike Rona, president. On May 21, 2004, Kaplan sent an invitation to the first group of Kaizen Fellows, who’d been nominated by VMMC’s executive leaders. The program continues today. The Kaizen Fellows program also was expanded and enhanced at Park Nicollet and, most recently, in the Province of Saskatchewan, Canada. John Black and Associates continues to offer and promote it as an important arm and development strategy for future leaders. Kaizen Basics training (1day) is an overview of basic Lean principles and tools. The seminar is a combination of lecture, simulations, video, case study, and group discussion. All employees are expected to attend Kaizen Basics, starting with the staff of the priority service line, who will encounter Kaizen events early in the transformation. JBA has a rigorous transition process to train internal Kaizen specialists and Lean leaders to conduct subsequent Kaizen Basics seminars. It is imperative for successful Lean operations that teams collect the right data. PQA is an approach to understanding flow production, which analyzes the relationship between parts and quantity/production output (or, in other words, patients, processes, and care delivery). PQA helps line up processes for flow production. This supports problem identification and improvement opportunities. This includes one day of classroom teaching with the remaining time spent on the floor observing processes. A value stream map is a visual tool to help see and understand the flow of the patient through the health care experience. It is used to identify improvement opportunities. Participants are taught how to create a map from direct observation and measurement of an identified process. Improvement opportunities are identified and an improvement plan is created. 5S is the foundation for any Lean healthcare transformation. It is a strategy for organizing the workplace to minimize the waste of time. A clean, well-organized workplace is critical to implementing Lean; having everything neat and in the proper location enhances quality and productivity by making things easier to find and making problems more visible. JBA conducts a 5S Train-the-Trainer workshop that is intended to train kaizen specialists to both lead 5S events and also train others to do so. This creates the capacity to implement 5S quickly across the organization. RPIWs are kaizen events that bring together a team of people who do the work targeted for improvement. They become fully engaged in a rigorous and disciplined five-day process, using the tools of Lean to achieve immediate results in the elimination of waste. JBA consultants coach the team lead, sub-team lead, and kaizen specialists on each RPIW team in the standard RPIW process. 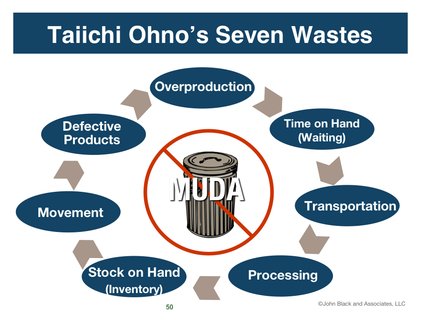 The team is taught to “see” waste and identify ways to eliminate it through the use of Taiichi Ohno’s Seven Wastes. The standard work for an RPIW includes 30-, 60-, and 90-day reviews after the event to ensure that the work area has held the improvements implemented during the RPIW event week. A standard transition process is defined by JBA to support a smooth handoff from the consultant to the internal kaizen specialist after an appropriate number of RPIWs have been supported by the specialist. Mistake-proofing workshops are part of the organizational campaign to eliminate patient and employee harm. These workshops utilize many of the same tools of the Rapid Process Improvement Workshops, but are specifically focused on eliminating defects. Using the Shigeo Shingo methodology of zero defects and understanding the concepts of jidoka and poka yoke, teams work to identify the root cause of the harm and then use a PDCA process to eliminate these defects. The standard work for these workshops also includes 30-, 60-, and 90-day reviews after the event to ensure the work area has held the improvements. 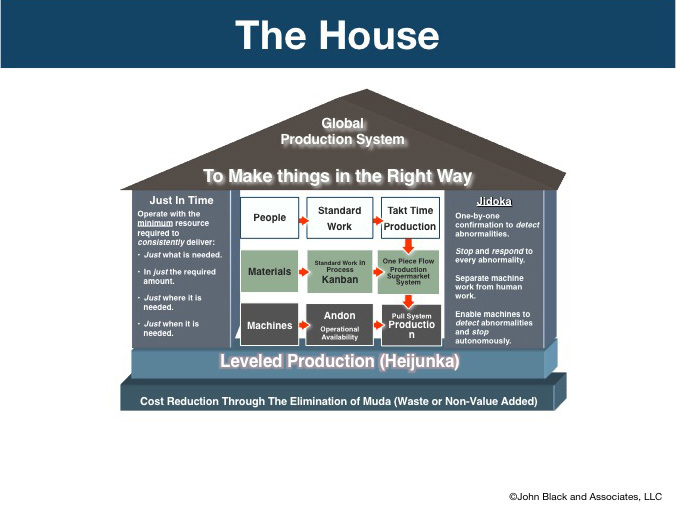 JBA starts the focus on supply chain and inventory reduction with a Learn/Do Kanban Workshop. This workshop can consist of three teams of 10 each, for a total of 30 participants, focused on primary service lines. Participants are taught the “just-in-time” scheduling system that helps determine what to produce, when to produce it, and how much to produce. The kanban card is, in effect, a message that signals depletion of product, parts, or inventory that, when received, triggers the replenishment of that product based on actual demand. When applied to healthcare for supplies, materials, tools, and drugs, kanban has proven to be a very powerful tool for saving space, eliminating unneeded inventory, and saving money. Kanban Kaizen events are structured similarly to an RPIW, with a week of data collection and preparation for the event, and then five days of implementation activity. Training Within Industry (TWI) plays a crucial role in the implementation of Lean healthcare. TWI is a technique that helps maintain standard, consistent methods and create a safer environment for patients and staff. Currently Virginia Mason, Seattle Children’s Hospital, and Saskatchewan’s Saskatoon Health Region are using TWI as a follow-up to the implementation of standard work. TWI is composed of three primary and three supplementary skill-based modules. JBA works with clients to define the right level of TWI training to ensure that all employees in direct or indirect leadership roles develop the skills to train and retain a productive, engaged, and loyal workforce. 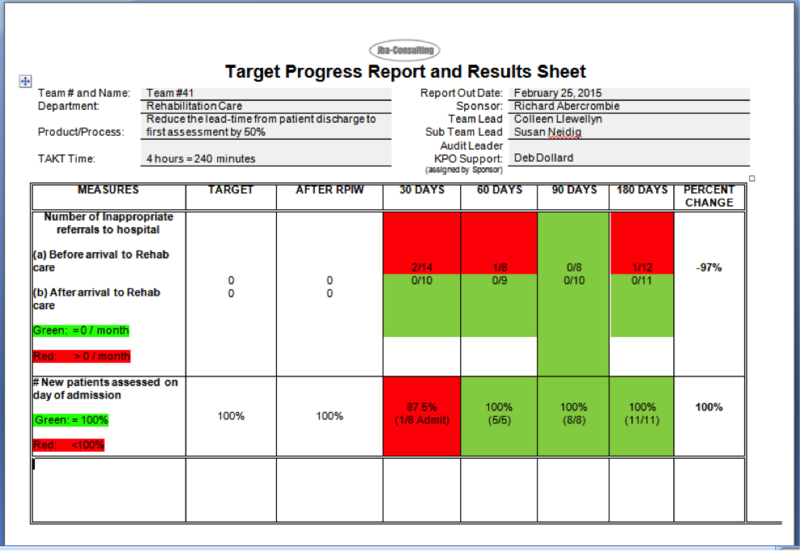 The management system is a vital component of any Lean healthcare transformation. It creates the link between strategy and daily work with accountability at all levels. JBA trains, coaches, and provides tools for ensuring the effectiveness of the management system. A system used to visualize the organization’s daily activities using facts and data to ensure that process, products, and services are continuously improved and always predictable. JBA conducts workshops on how to implement daily visual management and provides coaching support to kaizen specialists to deploy to every work unit. The major method for implementing breakthrough improvements. cross-functional management is always focused on the elements of full customer satisfaction. JBA supports the client to implement cascading measurement and a visibility system focused on quality, cost, delivery, safety, and morale. The system by which goals are determined, plans to achieve these goals are established, and measures are created to ensure progress toward the goals. JBA consultants guide clients through a complete cycle of Hoshin Kanri consisting of reflection, strategy development, catchball, strategy deployment, and diagnosis and review. 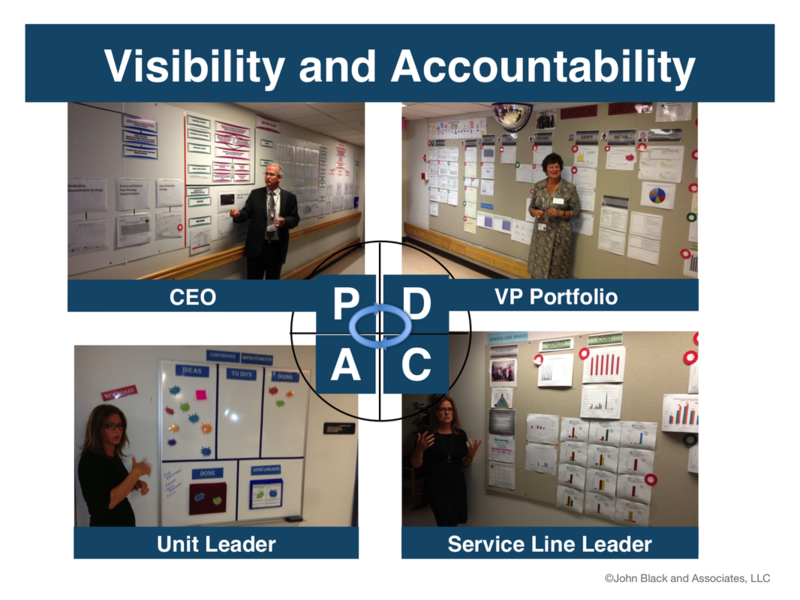 JBA coaches Lean healthcare leaders through the establishment of visibility and accountability. This starts with visits to world-class Lean operations, including the Virginia Mason Institute and a “greenfield” Lean operation, known as the JBA North American Tour. In this event, participants observe Lean healthcare flows and witness first-hand how data walls, leader involvement, Kaizen reviews and follow-up, and the management system itself build visibility and accountability into the organization’s transformation processes. As leaders are the key ingredient for transformation success, their role in sponsoring improvement events, regularly measuring and reviewing service line and organizational metrics, reviewing audits, and coaching subordinates to utilize the PDCA process is critical in establishing a Lean management system. All these activities are needed for sustained, continuous improvement.